In his programs for young children and his workshops for those who work with them, Tim’s special gift for this age group comes into play (in all senses of the word). 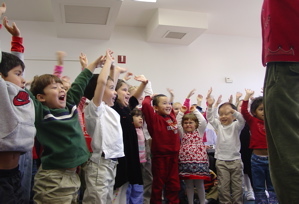 His program “Sing, Say, Laugh, Clap!”engages kids in lively songs, finger plays, flannel board stories, other participatory stories, and movement activities. These are not only captivating and fun, but also help develop language skills and literacy readiness. His workshops for Early Childhood teachers and staff, day care providers, and librarians have immersed them in favorite activities from his repertoire, accompanied by ideas for building on them to enrich learning experiences, and resources to help them explore further. • Preschools, daycare centers and public libraries under Community Partnership For Children grants. • VSA Arts of Massachusetts, as an artist in residence in many special needs and integrated preschool and kindergarten classrooms.